This year I have been invited to team up with *5 other local bloggers, to find and serve a family that is in need. I am honored and looking forward to seeing what we can do together, but we need your help! First of all, we are in need of nominations of a deserving family! We are looking for a family with children who lives within 25 miles of Salt Lake City, who could use some help this holiday season. Click HERE to fill out the nomination form. We are accepting nominations for a family that fits this criteria until Sunday, November 15th. All the information given will be kept confidential and will only be used if the family is chosen, so we can contact them to get the necessary information. You can nominate a family here or at the bottom of this post. 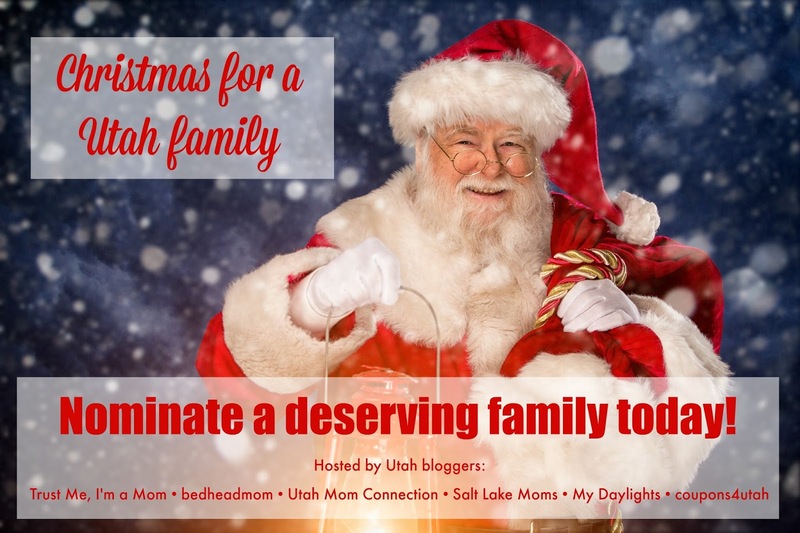 If you want updates on what our ‘deserving Utah family’ will need via Email once the family is decided, email me at michelle@trustmeimamom.com with the subject “Christmas Updates” so I don’t overlook you! OR you can join this Facebook page to stay updated, too! Lastly, you can donate physical items, gift cards or money via PayPal. Just email me for the details. *Special thanks to all of the bloggers teaming up with me!